Over the past few years Poland's Behemoth have become the darlings of extreme metal and for all intents and purposes have become not unlike their namesake. From their beginnings in the early 90's as a purely black metal outfit, they have steadily morphed into a blackened death metal band and have more recently come to rest closer to a modern death metal act. They have been widely praised for some time, but it wasn't really until the release of 2004's critically acclaimed (though somewhat overrated) Demigod that saw the band's success and popularity reach fever pitch. 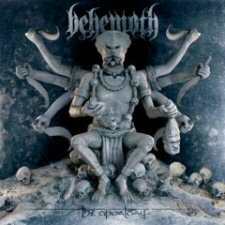 It was with interest and perhaps a little trepidation that I put on Behemoth's latest release, The Apostasy, for a listen. The album opens with an introductory piece called Rome 64 C.E. which begins with some interesting and quite unexpected female vocals that are reminiscent of a Middle Eastern religious chant before moving into a militaristic sounding riff replete with horns and pounding drums. There seems to be quite a bit of Middle Eastern influence on The Apostasy which leads to obvious comparisons to Nile's Annihilation Of The Wicked, though the ethnic influences are really the only major similarities between the two albums. As the second track, Slaying The Prophets Ov Isa, blasts into existence a number of things become apparent; there is more than a passing musical semblance to Demigod, Inferno's drumming has become a lot more impressive, and the Nergal's vocals sound a whole lot better than they did on Demigod. Though it had its moments, I can't say that Demigod really did it for me. It was fun for a while but quickly moved ever lower in my album rotation. The Apostasy, though it is musically cast from a very similar mould, manages to strike a better chord through its more subtle elements such as its lead work, its clever use of orchestration and its intricate, warlike drumming. I would go so far as to say that The Apostasy is Behemoth's heaviest album thus far. It is a seemingly non stop barrage of blast beats and double kick work. Drummer Inferno has put in one of the best performances of the year on this album, regardless of the obvious use of triggers. The performance is so good in fact that the drums tend to completely consume the songs and relegate everything else to the background. Nergal's vocals have been stripped back considerably on this album and are nowhere near as multilayered as on Demigod. They are raw, powerful and instantly recognisable as his. If there is one complaint to be had with The Apostasy it is the lack of truly memorable riffing. For all of the technical wizardry that is on display I find myself unable to remember much, if anything, of what I have heard once the album has stopped spinning. Whilst playing, the album is instantly likable and enjoyable but it is a temporary and fleeting experience. If Behemoth is known for anything then they are known for change. Each of their releases has shown the band to be in a constant state of progression. It is interesting to note then that The Apostasy isn't too dissimilar to Demigod. Though there are clear improvements to be noticed such as Inferno's drumming or the overall level of musical technicality, it is easy to see The Apostasy as a continuation or perhaps slight evolution of Demigod rather than a complete transcendence of it. There is no doubt that Behemoth have a winner on their hands with The Apostasy and that it is in many ways a triumph for the band. It is likely to be lapped up in great numbers by the metal community and not without good reason.